You read about Africa's animalsthis one is the largest, another is the tallest or fastest, but you don't often read about the pinkest. Well, that's the flamingo (Phoenicopterus spp.). As you round the road leading to the town of Nakuru in southwestern Kenya, you see below you an almost circular lake of shimmering pink. Here is a soda lake, with waters too foul to drink, yet rich in nutrients that feed tiny brine shrimp that in turn provide the food for the million or so flamingos. Most people are familiar with the flamingo as a lawn ornamentit's bright pink plumage and gangly appearance mark it as an oddity among birds. It feeds by inverting its bill, wading through water, seeing the world upside down. It is most abundant in Africa, in the soda lakes of the volcanic regions of Africa's Great Rift Valley. Here millions of birds take to flight in unison, one of nature's great spectacles. There are two species, the Greater (P. ruber) and Lesser (P. minor) Flamingos. 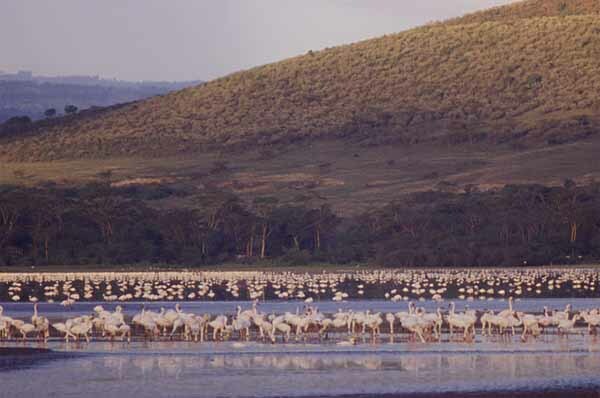 The flock pictured here is at Lake Nakuru in Kenya. This habitat is unique enough to be conserved by a small circular area surrounding the lake, forming Nakuru National Park.